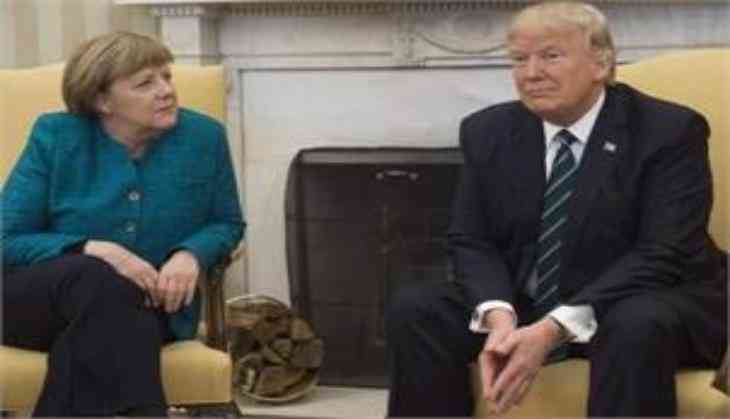 Ahead of the G20 Summit in Germany, US President Donald Trump has held "extensive discussions" with German Chancellor Angela Merkel over the key issues of climate change and trade. "In an extensive discussion (over phone), the two leaders addressed climate issues, the Women's Entrepreneurship Financing Initiative, and trade, including global steel overcapacity," the White House said in a statement yesterday. "The president said that he looks forward to helping Chancellor Merkel make the Summit a success," it said. The White House' statement comes ahead of the two-day G20 Summit to be held on July 7-8. Last week, Merkel had said discussions at the G20 Summit would be difficult given Trump's climate scepticism and "America First" stance, but that she was determined to seek a clear commitment to the Paris Agreement on climate change against global warming and a pledge against protectionism. When Trump had announced in early June that he would withdraw from the historic Paris Agreement, "we knew that we could not expect discussions to be easy" at the G20 Summit, Merkel had told the German parliament. Trump also spoke with Italian Prime Minister Paolo Gentiloni to discuss the agenda for the upcoming G20 Summit and to renew his appreciation for the Prime Minister's efforts in hosting the exceptional G7 Summit in May. President Trump also underscored his appreciation for Italy's efforts to address the significant Libyan migration crisis, the statement said. The 12th G20 Summit, a major port city in northern Germany, will also discuss issues like free and open trade, climate change, migration, sustainable development and global stability. Counter-terrorism and economic reforms will dominate the discussions amongst the leaders of the world's 20 largest economies at the G20 Summit which will also be attended by Prime Minister Narendra Modi. The 'Group of Twenty' is made up of 19 countries and the European Union. The countries are Argentina, Australia, Brazil, Canada, China, France, Germany, India, Indonesia, Italy, Japan, Mexico, Russia, Saudi Arabia, South Africa, South Korea, Turkey, the UK and the US.